Pity the poor novelist, especially one who has had at least one successful book in the past. There's always pressure to live up to the former glory, as well as a possible unfortunate tendency to want to bask in past fame even when more recent efforts haven't been as successful. 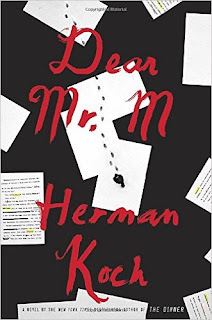 The world of a popular novelist and his attempts to remain relevant form the basis for Herman Koch's new novel Dear Mr. M.
M. is how the author is referred to throughout the story. Now nearing 80, his most famous book, Payback, dealt with the real-life disappearance of a local history teacher (who happened to be having an affair with one of his students). In the years since that success, M. has followed up with several novels, including one cruelly exposing the "faults" of his ex-wife who left him for a disheveled artist. He now writes mainly about events that happened during WWII. M. currently lives in an apartment in Amsterdam with his young second wife and 4 year old daughter. Living above M. is someone we quickly discover was actually involved in the events surrounding the disappearance of the teacher from M.'s bestselling novel. M. has no idea that his neighbor played a part in this story. M., in fact, shows little interest in anything other than himself (if the neighbor's viewpoint is to be believed). The neighbor spends quite a lot of time monitoring the lives of M. and his family, and isn't at all impressed with the behavior, conceit or intelligence of M.
The story is told from the alternating viewpoints: of M., the neighbor, Laura (the girl having an affair with the teacher and a fellow student), and eventually even that of the teacher who disappeared. The events shift from the present back to the events leading up to the fateful day of the disappearance. We eventually learn that the neighbor's name is Herman, which M.'s wife remarks is the same name as her husband. So the young man at the center of the disappearance, the writer in the story, and the author of the book all are named Herman? I'm not sure what the reader is supposed to make of that. The events surrounding the disappearance of the teacher make up the plot of the story, but a good 1/3 of the book deals with tedious descriptions of the writer M., his life, his thoughts on fellow writers, interviews with him about (what else?) himself and how he came to write this or that . . . the book really bogs down with all this unnecessary commentary. It adds nothing to the story, only to let us know how self-absorbed M. is and how much back-biting and rivalry there is in the publishing industry. For the events of the story the reader really wants to know, however, there are many gaps. Characters appear and leave without any indication of what might have happened to them other than vague, tantalizing statements that are never clarified ("After what she did . . ."). Other statements are startlingly dropped into the story and never explained ("She could sense something about me . . .", "She had to tell me several times because I didn't understand . . ."). Yet we get page after boring page about M.'s thoughts on his fellow writers. I can understand that the author wants the reader to fill in some of the details on his or her own, but it would have been nice to have more events in the actual "mystery" clarified rather than being privy to every stray thought in M.'s head.